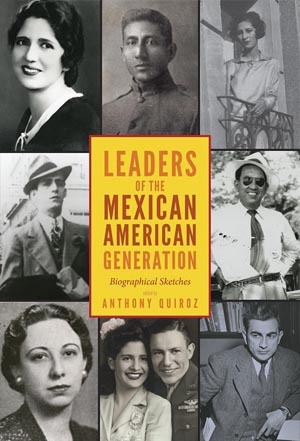 Edward R. Roybal: Latino Political Pioneer and Coalition Builder, in Anthony Quiroz, ed., Leaders of the Mexican American Generation(Denver: University of Colorado, 2015). Kenneth C. Burt's chapter sheds new light on the political career of Edward R. Roybal of Los Angeles. Burt describes Roybal as being born to a working-class family with deep roots in American soil (four hundred years) and who served in the military during World War II. As with many veterans, he returned to the United States ready to make significant changes in conditions for Mexican Americans. Drawing together an impressive cadre of scholars exploring the interplay between individuals’ personal biographies and the larger currents of U.S. society, the contributors to the anthology Leaders of the Mexican American Generation offer new insight into the multidimensional histories of a range of actors influential on the national stage between 1920 and 1960. Attention to notable individuals, major political currents of the time, and biographical method make the book of value to both a general audience and students of Mexican American history. “The chapters collectively present a compelling argument that these thirteen activists, while embracing American citizenship and ideals, effectively used weapons such as “union organization, the ballot box, and the lawsuit” (346) in their fight for equality. — Harriett Denise Joseph, Southwestern Historical Quarterly.